“COPE” CHOPS: FEEDING HUNGRY DJs FOR ALMOST 4 DECADES! “Cope” chops are the creation of my long-time radio buddy, Marc Coppola, who can be heard from Cape Cod to California. Cope and I started in radio at WBAB on Long Island back in the early 80’s. He had the afternoon drive shift, and I was on after him from 7 to midnight. 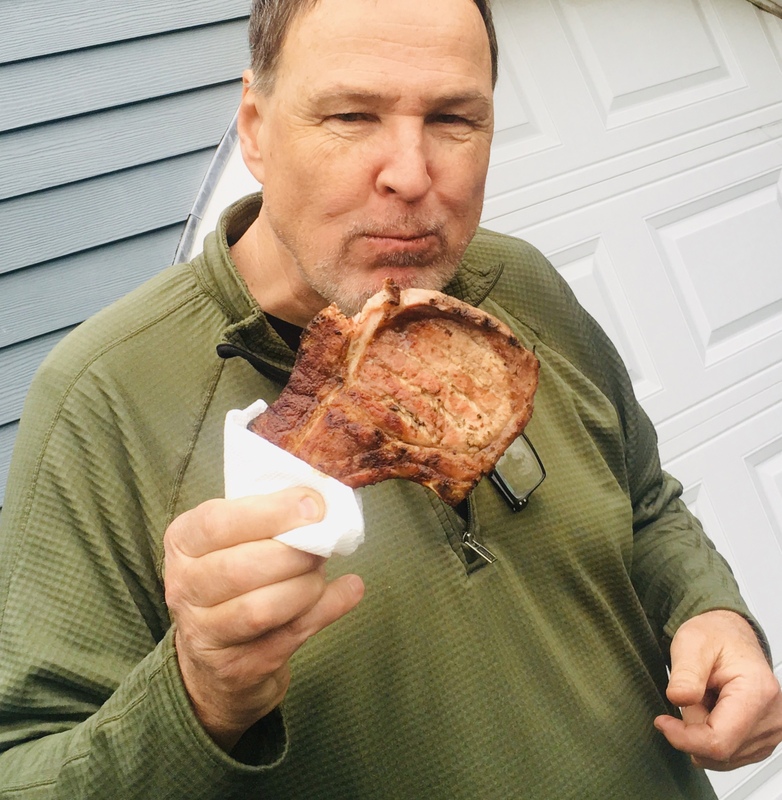 After his show, Cope would remove a hibachi grill out of the trunk of his car, light some charcoal in the radio station parking lot, and he’d grill up the most amazing pork chops I’ve ever had. They were thin, but juicy and beautifully charred, with a wonderful saltiness. He called ’em “Cope chops,” and we’d eat them by the stack, wrapping the hot bone of the chop with a paper towel, and then just chowing down. It was a great memory, and one that I regularly re-live by grilling Cope chops at home even today. After three decades, I’m not sure if my Cope chop recipe is the same as the original, but they are damn good and incredibly easy to make. Ironically, for this recipe, I don’t go all out and spend big money on thick, expensive pork chops. I want them thin, fatty and with the bone in. This is not a low-and-slow process: the secret to the success of these chops is to cook them hot and fast, sealing in the juices. Place the pork chops in a flat bowl, and pour the wine over the top, making sure you cover the chops. Let them marinate for at least an hour at room temperature, flipping them over halfway through so that all sides get covered by the wine. Light a hot hardwood charcoal fire. Pour off the wine from the chops and discard. Place the chops on the hot grill and season the top with the Lawry’s seasoned salt. 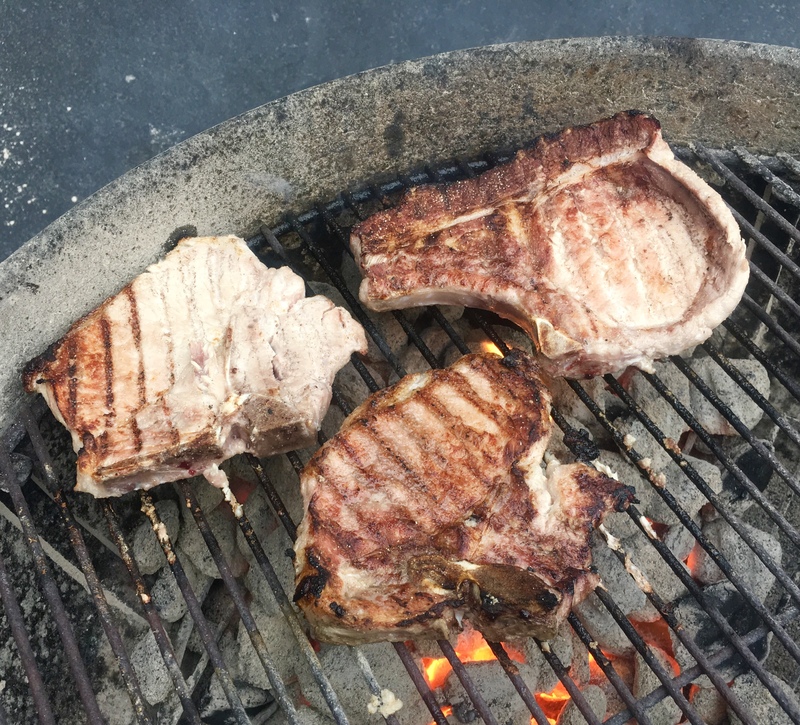 Once they’ve charred nicely, flip the chops over and season the other side. Grill until the chops are cooked all the way through, but not dry. Serve immediately. The proper way to eat a Cope chop: wrap the bone in a paper towel and chow down!